Aldon Nielsen and Jerry W. Ward, Jr. I recall this series of conversations and reading events during my undergraduate years at Tougaloo College in Mississippi during the late 1990s that first led me to certain literary scholars and books. My professor Jerry W. Ward, Jr. offered some advice on how to expand my understanding of poetry. He knew I was working on an independent project on the poet Lance Jeffers and becoming interested in this thing known as the Black Arts Movement. During the summer of 1997 while in Atlanta, Georgia, participating in the UNCF/Mellon program, I "discovered" this book Drumvoices by Eugene B. Redmond. A year or so later, I was in front of the Berkshire building where English classes were taught at Tougaloo, and I saw Ward. He had just returned from a conference where one of the main speakers had discussed some really fascinating ideas about black poetry. I recall that he was still excited about what he learned from the presenter. "His name is Aldon Nielsen. He's our leading poetry critic," said Ward. "You need to be reading him." I was informed to get my hands on Nielsen's book Black Chant. "Aldon Nielsen? He writes about poetry?" I asked. I wasn't sure why the idea of Nielsen as a poetry critic seemed off to me when I first heard it. Then, I remembered later that day when I went to the history building. In addition to studying English, I was pursuing a double major in history at Tougaloo. 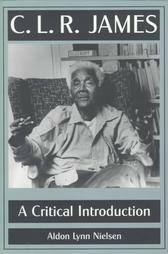 My professor for an independent study course in history had this book C. L. R. James: An Introduction on her bookshelf, which I had previously glanced at many times while stopping by her office. The image on the cover of the book was memorable, and the author was Aldon Nielsen. When Ward had mentioned Nielsen in relation to poetry earlier that day, there was a slight disruption in my mind because I had thought of Nielsen as a historian or biographer. I had first "discovered" his work in the history department at Tougaloo. In retrospect, it was perhaps a useful mind exercise that I was being compelled to wrap my undergraduate mind around the idea of Nielsen as a cultural historian and poetry critic. Writings by Redmond, Nielsen, and Ward are now part of a larger body of scholarship that help shape my understandings of African American poetry. It's interesting, however, how following those poetry scholars early on led me to all kinds of new places.